All boxed chocolates will be 1/2 price in Waitrose this coming Friday. Gonna be some cracking deals on some quality chocolates so probably gonna sell out fast in store. Waitrose - in store that day and if you have a delivery booked for that day. They got offers each day from Friday leading up to xmas, half price cheese on sat, and half price xmas fruit cakes on sat....... ties in nicely with the £10 off £50 spend vouchers i had through the post today. Waitrose - in store that day and if you have a delivery booked for that …Waitrose - in store that day and if you have a delivery booked for that day. Was referring to it saying Tesco's in the post.. Its a Waitrose offer. Sorry Waitrose not Tesco. Amended now. They better have Ferrero Rocher and Lindor boxes when I get there!!! Hmm the boxes of Prestat strangely don’t appear in this offer?! So much for ALL boxed chocolates! If only most of my family weren't dieting.... I'd have solved all my prezzie problems. Limited stock, if anything like last year most lines sold out within one hour of store opening. If you for order online delivery prepared to be disappointed. Limited stock, if anything like last year most lines sold out within one …Limited stock, if anything like last year most lines sold out within one hour of store opening. If you for order online delivery prepared to be disappointed. yeah i placed a large order for friday, do you think they wont havr stock then ? yeah i placed a large order for friday, do you think they wont havr stock …yeah i placed a large order for friday, do you think they wont havr stock then ? Depends on the items you ordered and what time your order is prepared. Going by my experience of last year's one day sale event it was hit and miss. Hope you get what you ordered. Depends on the items you ordered and what time your order is prepared. …Depends on the items you ordered and what time your order is prepared. Going by my experience of last year's one day sale event it was hit and miss. Hope you get what you ordered. are their own brand chocolates any good? Hmm the boxes of Prestat strangely don’t appear in this offer?! 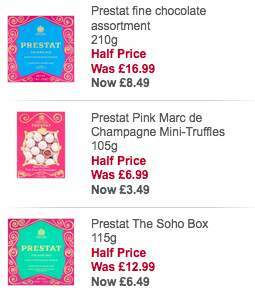 So much f …Hmm the boxes of Prestat strangely don’t appear in this offer?! So much for ALL boxed chocolates! What do people expect for the price? I had a tub of Morrisons Megamix sweets around Halloween which were £3 for 1kg! I thought they were a cheap immitation yet the family liked them. Got to my Waitrose for opening and reckon 3/4 of stock went in first 30 minutes. Glad I managed to get a few boxes of both Ferrero Rocher and Lindor chocolates. The staff stacking them couldn't keep the shelves filled at my local. They did in Chester store. Damned offers..... Just bought far too many chocs... Still a fair bit of choice even though it is late in the day.